INDIANAPOLIS, Ind. – The Grand Council of Tau Kappa Epsilon is proud to announce the appointment of Frater Walter W. Jenny, Jr. (Omicron-Phi, Univ. of Oklahoma) as Judiciary Chairman. Walt currently serves as a GPA while living in Oklahoma City. He has been a "major driver" in the development of many chapters in the Central United States. Frater Walt graduated from the Oklahoma City University School of Law. He has practiced law in Oklahoma since 1983. He served as a Chapter Advisor at Omicron-Phi and Epsilon-Sigma, and as a District Vice President. A Life Loyal Teke, Walt has been recognized as the Key Leader (2001), Volunteer of the Year (2005), and Grand Prytanis Award (2009). He recently attended the Grand Opening and William V. Muse Volunteer Academy. 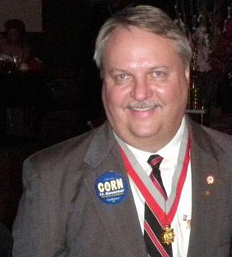 Frater Walt has also attended and presented at Regional Leadership Conferences and Conclaves throughout the years. In his professional life, Frater Walt has served as legal counsel for several state agencies and is currently Assistant General Counsel for the Oklahoma Department of Labor. He was Secretary of the Oklahoma Democratic Party from 2005 to 2009. He was also a presidential elector for Barack Obama in 2008. He served on the board of directors of Central Oklahoma Habitat for Humanity for four years, including one year as chair. Founded January 10, 1899 at Illinois Wesleyan University, Tau Kappa Epsilon is the world’s largest social fraternity with chapters on 276 campuses in the United States and Canada. TKE has initiated more than 250,000 men since its founding. The Fraternity aims to build better men for a better world. For more information on the appointment, please contact Fraters Shawn Babine or Tom McAninch.